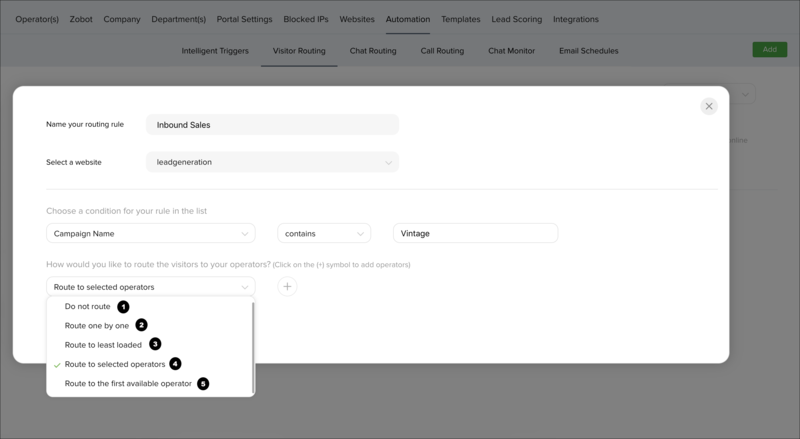 Now you can separate and route the visitors to specific agents using the Visitor Routing option, you can set specific filters for the visitors by setting different rules and route the visitors to different agents. 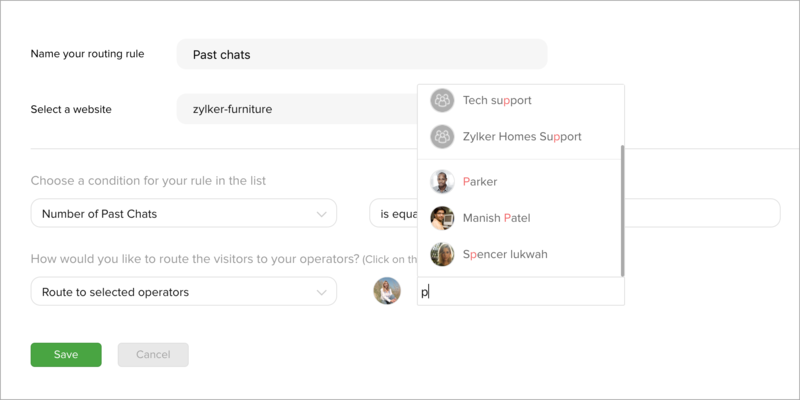 For example, if your major customers are from United States and you wanted to assign two specific agents for the country, then you can set the filter and assign your agents. The visitors visiting from United States will only be routed to the two specific agents. How to Route Visitors to Specific Sales Executives? How to delete a Visitor Routing rule? What is the Order of Visitor Routing? Click on the Add button in the right top corner of the page. Click on the + symbol that appears near the Top three suggestions of Countries/ Region/ Landing Pages/Operating System. Click on the Let’s start link at the bottom of the page. The rules section will then appear, select a pre-defined condition from the drop-down. Select the required condition in the drop down and enter the value in the text box. Browser used by the visitor in the website. Country Country of the visitor accessing the website. CRM Contact Contact information of your website visitors in Zoho CRM, Click to know more. CRM Lead Lead information of your website visitors in Zoho CRM. Click to know more. CRM Potential Potential value of your website visitors in Zoho CRM. Click to know more. CRM Account Account information of your website visitors in Zoho CRM. Campaign Source UTM used to identify a search engine, newsletter name, or other source. Campaign Medium UTM used to identify a medium such as email or cost-per- click. Campaign Term UTM used for paid search eg: keywords for the ad. Campaign Content UTM used for testing and content-targeted ads. Campaign Name UTM used for keyword analysis to identify a specific product promotion or strategic campaign. IP address IP address of the visitor visiting the website. Landing page URL of the page where the visitor have landed in the website. Landing page title Title of the page where the visitor landed in the website. Number of past chats Count on number of past chats with the visitor. Number of visits Count on number of visit by the visitor in the website. Operating system used by the visitor. Referrer Source from where the visitor is referred from. Region of the visitor in the website. Search engine used by the visitor. State State of the visitor accessing the website. The type of visitor in your website. Web Embed Embed in the website where he visitor is accessing. Advanced To set two or more conditions. City City from where the visitor is accessing the website. Category of the visitor in CRM. Now, set a criteria for your condition by selecting an option from the drop-down. Do not route - Visitors will not be routed to any Operators. Route one by one - Visitors will be routed to the Operators one by one, when they are online. Route to Least loaded - Visitors will be routed to the least loaded operator based on the visitor count when they are online. 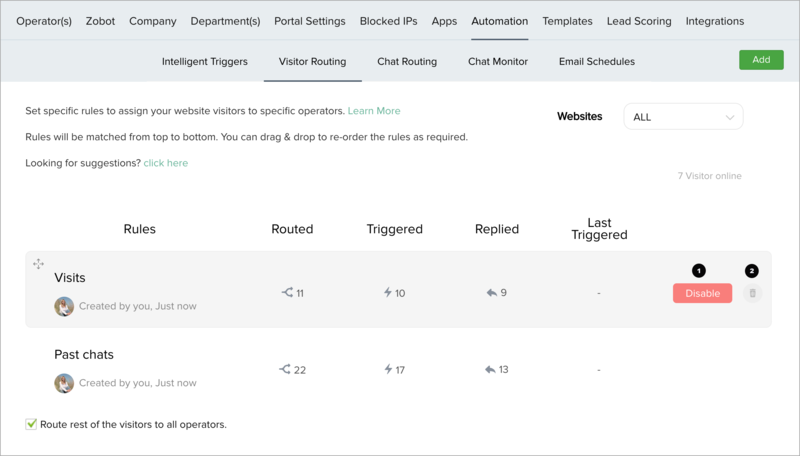 For example: If an operator has 10 visitors on their tracking screen and the the other operator has 11 visitors then the next visitor will be routed to the least loaded operator. Route to selected operators - On selecting, an option to choose the operators to route will appear. And, the visitor will be routed only to the selected Operators. Route to First Available Operator - Visitors will be routed based on the first availability of the operators. If the "Route rest of the visitors to all operators" option is enabled, then the rest of the visitors will be routed to all other agents. Then click on the + symbol next to the drop-down to select operators, a small text box will then appear, enter the agent name in the text box. To delete the selected operator, click on the - symbol that appears when hovered. Select the checkbox below, to route the rest of the visitors who don’t match the above rule to all other operators. In the below example, two rules are set to route the visitors. In the First rule, if the number of Open CRM Potential is more than 2, then the visitors will be routed only to the selected agents. In the second rule, if the number of past chat of the visitor is more than 5, then the visitors will be routed only to the selected agents. 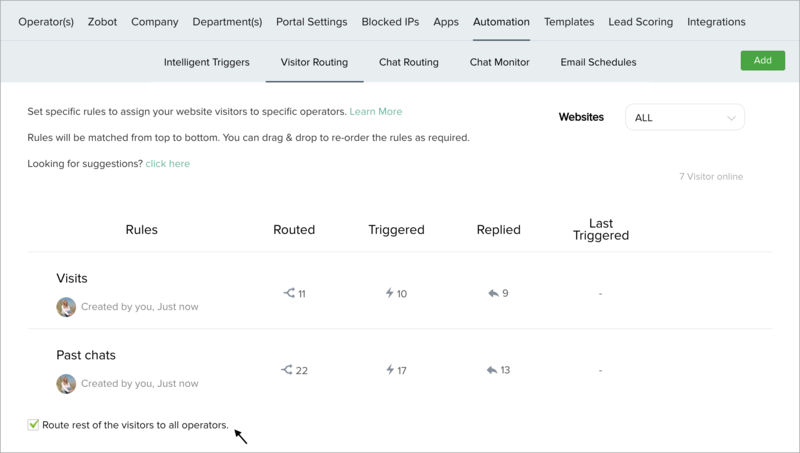 In the right side of the rule you will be able to see the number of visitors routed to the specified agents based on the rule. The rest of the visitors visiting your website will be routed to all other agents. The top three rule suggestions will appear based on the visitors in your website. For example, if major number of visitor is from United States, then the top three suggestions will suggest United States as the first option in the countries list to set a rule. If no visitor is found on the website then a random suggestion will be listed in the top three. To disable the rule, click Disable button. To delete a rule, click on the Delete(trash) symbol in the right side of the rule. The rules follow a top-down execution method, whichever rule first matches the visitor criteria will be executed. You can rearrange the rule order by Dragging and Dropping the rule (Top-Down, Bottom-Up).